Born: 1 January 1977, Nirmali, Bihar, India, as Ashim Prakash Bajaj, son of theatre director, academician, actor and former director of the National School of Drama, Ram Gopal Bajaj [1940-; awarded the 'Padma Shri' in 2003]. Education: Nirmali High School [1986-89]; Delhi University [1991-93; BA Drama]. 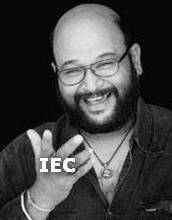 Career: 1989-1991: Started doing theatre with street kids for two years under the banner 'Nirmaan Kala Manch' during which some famous Indian and English plays like 'Jasma Odhan', 'Bakri', 'Caucasian Chalk Circle', 'Bidesia', a.o., were performed. 1992: Trained as a stage manager at three major workshops for about three months with the National School of Drama, New Delhi. 1992-1993: Did Hindi theatre in Delhi with the theatre group 'Act One' and was actively involved in backstage, lighting, acting and music composition for a period of two years. Some prestigious plays include: 'Incident at Vichy', 'Holi', 'Netuaa', 'West Side Story', 'Mother', 'The Glass Menagerie', 'Galileo', etc. Ph commercials dir by Ajay Devgan, Rajesh Krishnan, Leena Yadav, Anil Naidu, a.o. Ph music videos dir by Rajesh Krishnan, a.o. 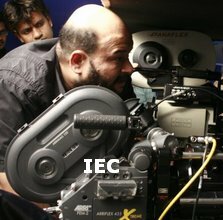 Member of the Guild of British Camera Technicians [GBCT] and Western India Cinematographers Association [WICA]. Was member of the Jury for the Filmfare Awards in 2007 and 2009. Married to dir Leena Yadav [2001-present]. Was co-prod of his wife's film 'Parched' [2014; ph Russell Carpenter]. Awards: As doph: Asia Image Award, Singapore, 'Best Cinematography'  for B4U's music promo 'Now in Europe' [d: Rajesh Krishnan]; Sansui Viewer's Choice Movie Award 'Best Cinematography' , Filmfare Award 'Best Cinematography' , International Indian Film Academy [IIFA] Award, Amsterdam, 'Best Cinematography'  & Asian International First Film Festival, Singapore, 'Swarovski Trophy for Best Cinematography'  for 'Chameli'; Zee Cine Awards 'Best Cinematography' nom  for 'Shabd'; Humboldt International Film Festival [Calif., USA] 'Eagle Eye Award for Cinematography'  for 'Boond'. As prod: Mostra Internazionale di Cinema del Salento/Salento International Film Festival [Casarano, Italy] 'Miglior Corto/Best Short Film - The World in Short' [2010; shared] for 'Thank You for Now'. 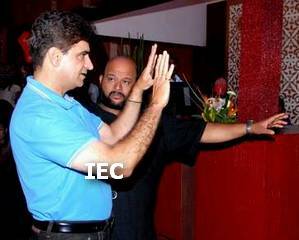 With Indra Kumar [left] - "Double Dhamaal"
X - Past Is Present [11 directors; 1 story] c; ph section dir by ? Ph programs and shows for ZoOm Television, Satellite Television Asia Region [STAR], Zee Television, Sony Entertainment Television [SET], MTV and SAB TV dir by Kundan Shah, David Polycap, a.o.